Let’s keep going and try to configure BGP local preference attribute using route-policy. We can take full advantage of topology and configuration from the last post: “BGP default local preference in Huawei CLI“. Assure full connectivity based on the attached topology (look at the previous article). Configure Loopback 10 and Loopback 20 on router AR4. 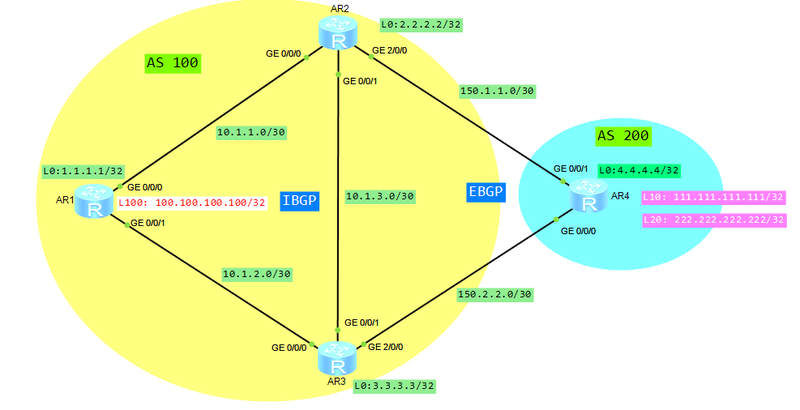 Import all Loopback interfaces of router AR4 to BGP. Traffic directed to network 111.111.111.111/32 is leaving AS100 through AR2 router. Traffic directed to network 222.222.222.222/32 is leaving AS100 through AR3 router. Keep local preference 100 for all other traffic. Let’s come to the point. *>i  4.4.4.4/32         150.1.1.2       0          100        0      200? * i                     150.2.2.2       0          100        0      200? *>i  111.111.111.111/32 150.1.1.2       0          100        0      200? *>i  222.222.222.222/32 150.1.1.2       0          100        0      200? As you can see all traffic is leaving AS100 through AR2 router. The first one permits source IP of Loopback 10 of router AR4. The second one permits source IP of Loopback 20 of router AR4. The third one permits all other networks. *>i  111.111.111.111/32 150.1.1.2       0          300        0      200? * i                     150.2.2.2       0          200        0      200? *>i  222.222.222.222/32 150.2.2.2       0          300        0      200? * i                     150.1.1.2       0          200        0      200? Finally we did what we wanted to do. Our route-policy is working properly and traffic directed to Loopback 10 of AR4 router is going through AR2. Traffic directed to Loopback 20 of AR4 is going through AR3. For remaing traffic, local preference attribute is not to be taken into account for choosing the best path.